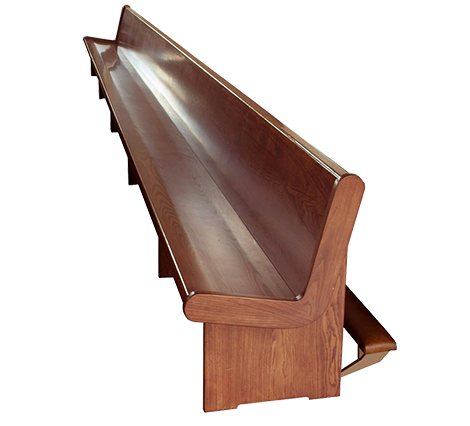 ﻿ Church Pews Construction | The Wood and Iron Factory, Inc. 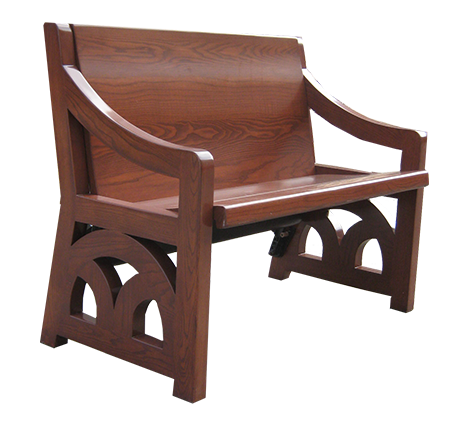 The Wood & Iron Factory manufactures only custom liturgical furniture. We are dedicated to manufacturing the finest furniture of the absolute best quality to be found in the industry. Every project we undertake is special to us. 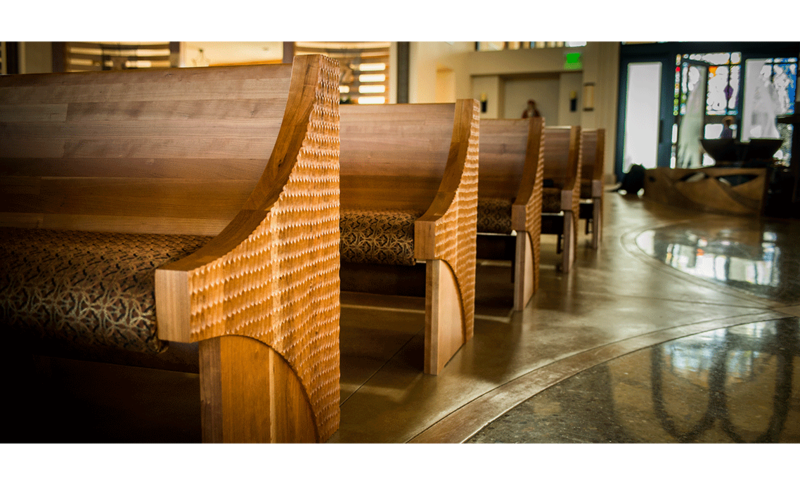 Our custom Pews are designed to ideally complement each individual church with balance and harmony. So what makes a pew from The Wood & Iron Factory the best in the industry? 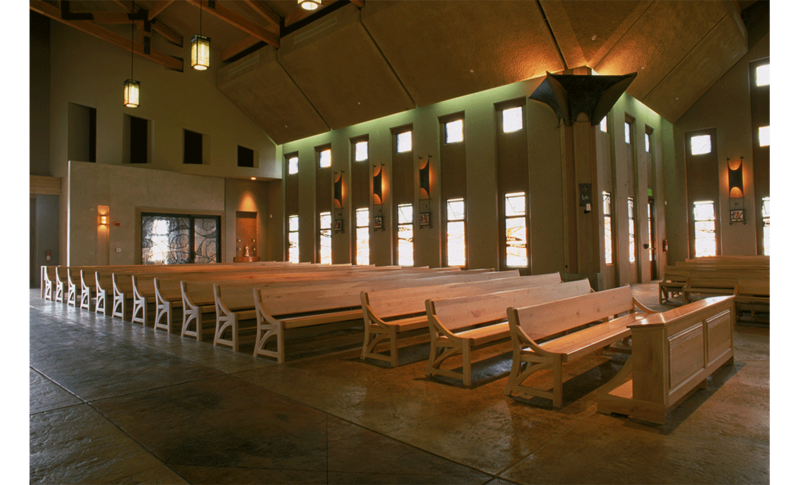 The Wood & Iron Factory uses only solid hardwoods to create our pews. 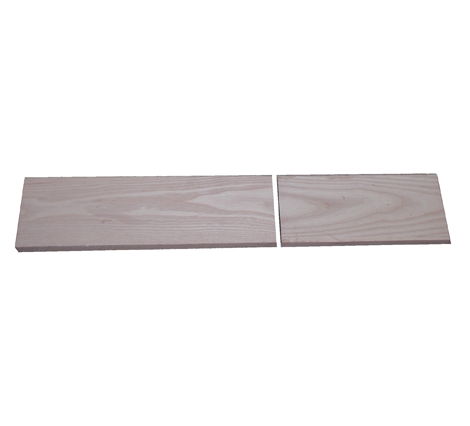 We never use plywood, particle board or veneers. 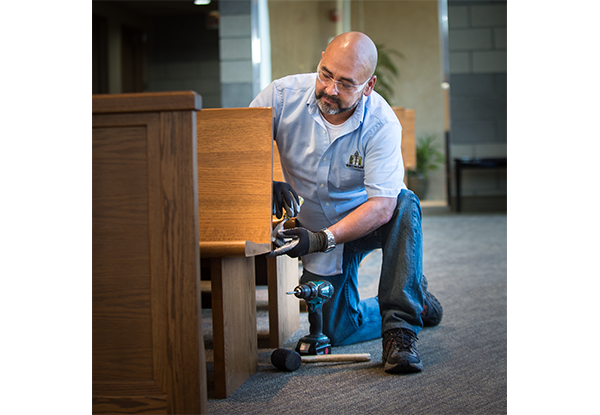 Only wood from certified mills, ordered specifically for each individual church, are used in our custom-crafted liturgical furniture. We work with different species of wood obtained from around the world, so you have a diverse selection of fine quality wood to choose from. The FSC label provides a credible link to ensure responsible production and consumption of forest products. This enables our clients to make purchasing decisions that benefit people and the environment, as well as ensuring that the furniture we craft is of the highest quality material. Our pews are all custom designed. 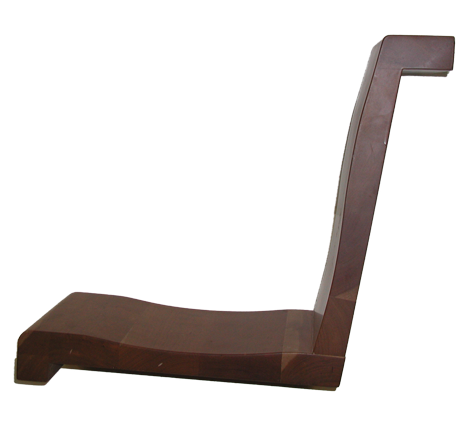 Pew ends are designed for each individual church and are never duplicated. 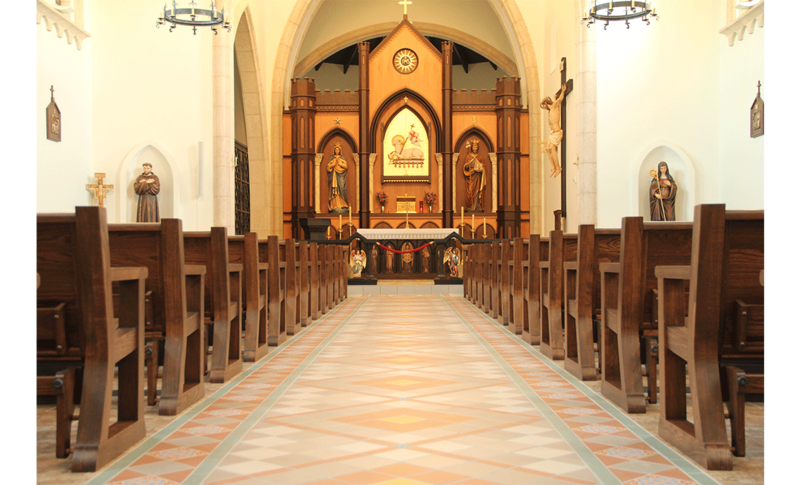 Hand carving and inlays of wood, stone, or metal are available to complement the design of the church. 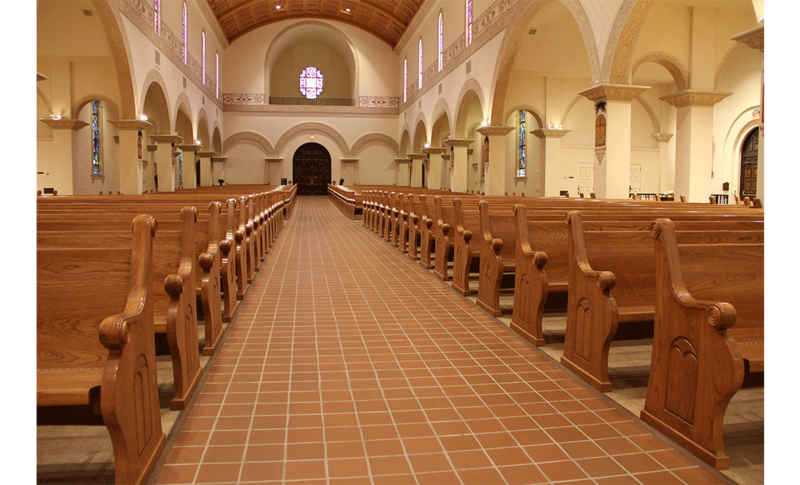 After your design is confirmed on paper, we produce an exact sample of the pews that would be manufactured for your church. Then you can review every detail of the shape, size, any detail work and final finish prior to fabrication. After this sample is approved, we can proceed with the final construction. Splices are cut on a 30 degree angle. 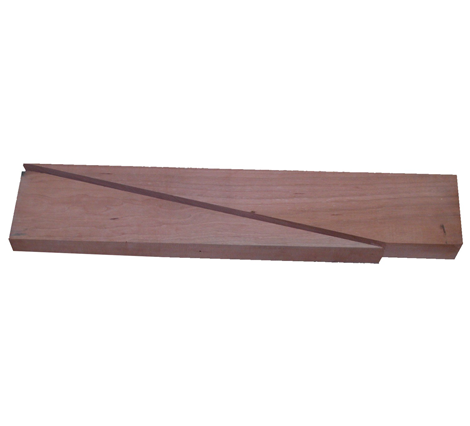 This makes the pew stronger and creates an almost invisible splice. All joints are glued and clamped for a minimum of 48 hours. 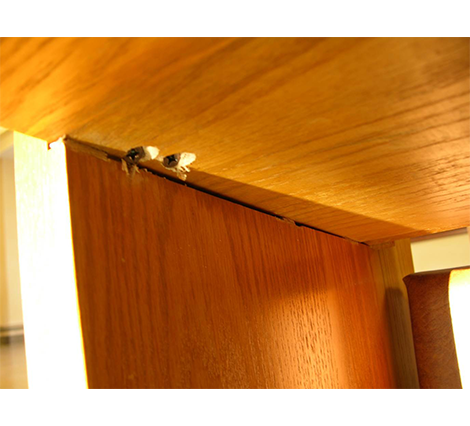 All exposed screws have wood caps or are covered with molding. 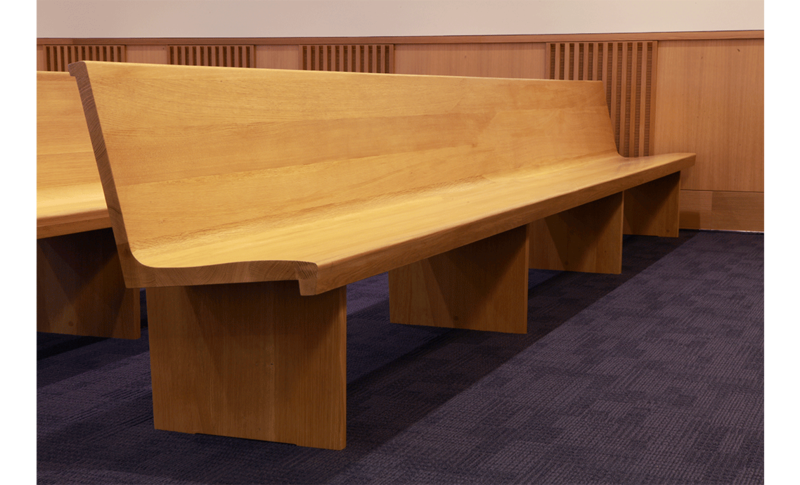 The seats and backs are ergonomically shaped, making this the most comfortable pew in the industry. The 2 ½” cap rail along the top of the seat back is more comfortable for your arms while kneeling. 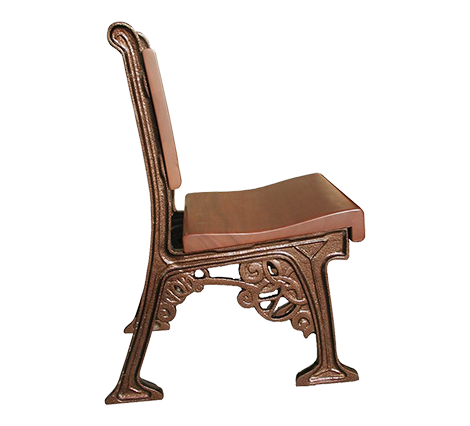 The 1 ½” bull nose along the front edge of the seat is stronger and more comfortable than a rounded edge. The pews are fabricated from a minimum 1 ½” stock. This makes them structurally superior and significantly more durable. 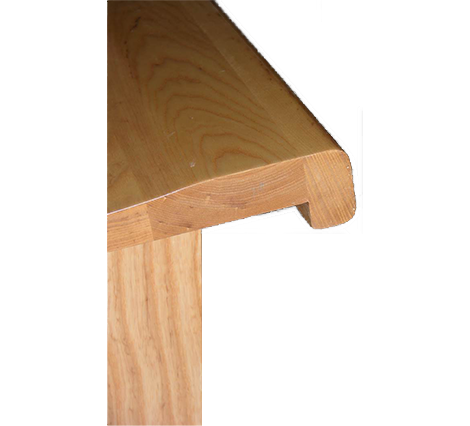 Where the pews are mitered together, we dowel the joints to insure that they will never move or create a jagged edge. 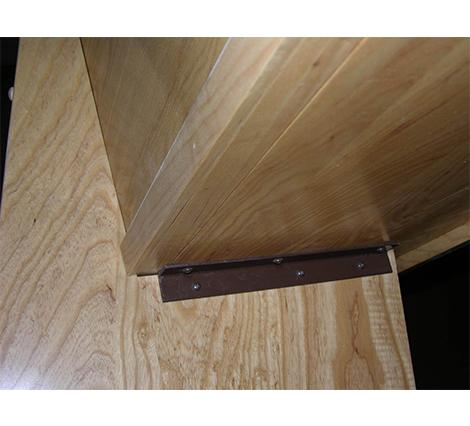 We anchor the end supports and all interior supports with a hidden anchor system. No floor is 100% level. All our supports are scribed to the existing floor conditions. 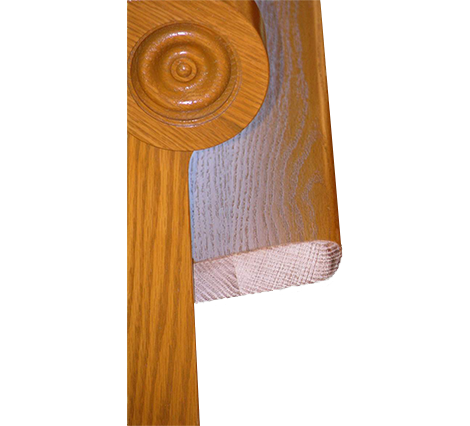 We do not use shims to level the pews because with time, shims will work out, leaving the pew support loose. 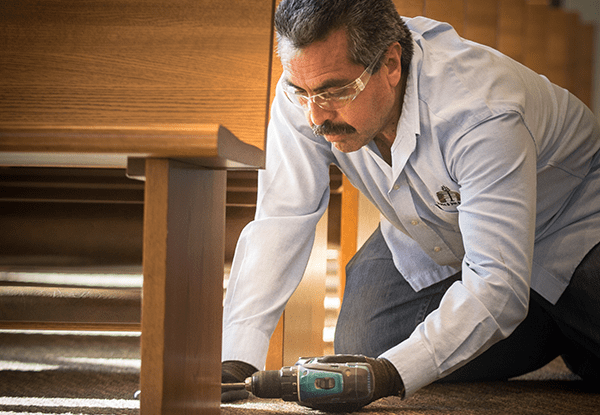 We finish ALL edges, including the bottom where the pew rests on the floor. 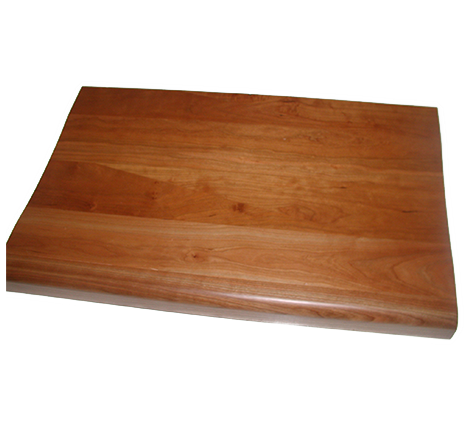 This totally seals the wood and prevents any moisture - (such as from mopping or steam cleaning) - from entering the wood. 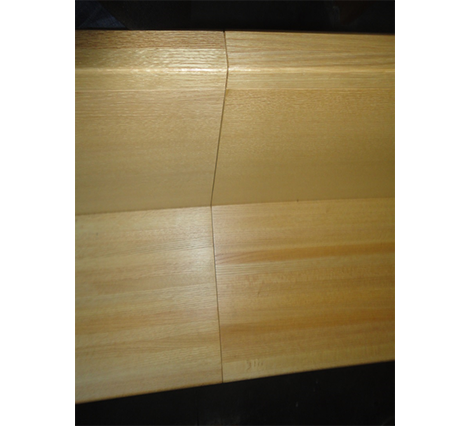 We DO NOT leave any unfinished ends or support edges. Stain is available in any color. For our final finish, we use three (3) coats of Catalyzed lacquer, which is the best finish available. 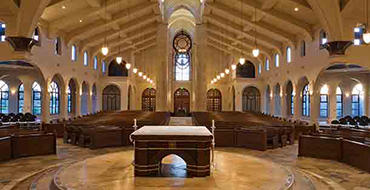 This is the same finish that we used on the pews at Our Lady of the Angels Cathedral in Los Angeles. 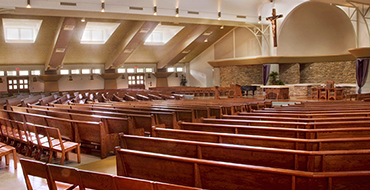 They have had over 8 million people visit and the pews still look like new. The first coat is applied right to left, allowed to dry, and then sanded. The second coat is applied top to bottom, allowed to dry, and sanded. The final coat is then applied left to right; this insures that there is no possibility of a lightly covered area. We then finish our pews with a wax finish. All pews are individually wrapped for shipment. 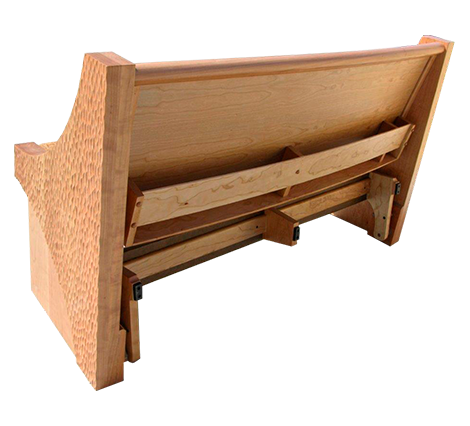 Our bookracks and kneelers are made of the same solid hardwood as the pews. We can include pencil or cup holders, and we can also provide different sizes to accommodate various books. Installation is performed by experienced Wood & Iron Factory employees. We do not use outside subcontractors. Our professional installers work as a team and are familiar with the project requirements and our design specifications. In every instance, the project manager who supervises the entire production from origination to completion is also part of the installation team.